It’s starting to be a common trend to be fishing a fresh Lake Pontchartrain during the spring months. Now that the MRGO is completely closed the Pontchartrain basin is a tough place to target trout during the spawning month’s. April-Sept trout really need high salinity levels to lay their eggs and out eco system simply doesn’t provide that anymore during these months. 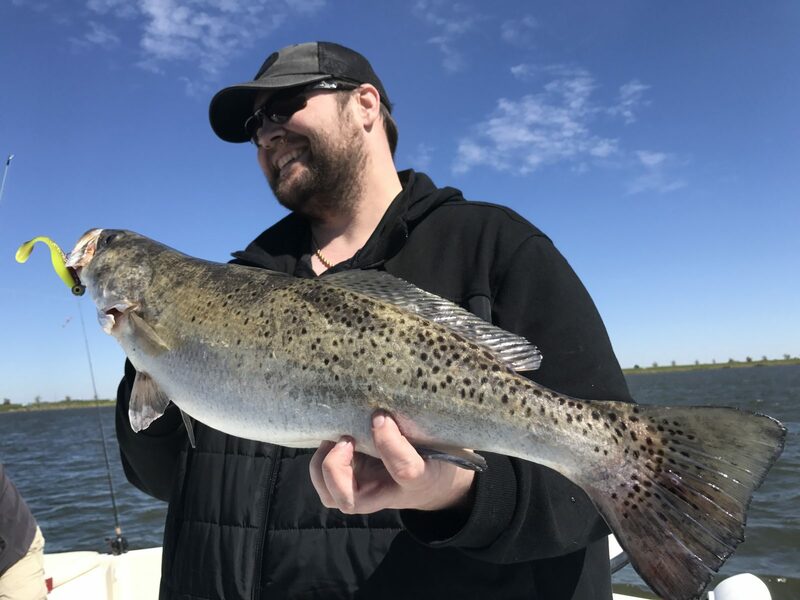 We still get some type of run every spring on the bridges and surrounding areas but trophy trout are scarce this time of year and it seems the only time we have a real shot at those 6,7 and 8 pounders is in the fall and winter. We did have a nice run on some big trout this February trolling all of the man made canals on the northern end of the lake but those big fish are going to have to seek out saltier grounds for the next few months and the Lake is simply not going to be able to produce that for them. With the spillway opening again this March, which seems so common now, we will struggle again for another spring. Although the opening of the spillway will hurt the fishery for this spring it does do a couple of good things. One is that the fish will compress and pile up in where ever a few clean pockets are found before it completely plagues the area and two the Mississippi River will dump plenty of nutrients in the basin which typically sets up for a banner fall run starting in October. One the other hand it is producing an algae bloom on the NW side of the lake that can be detrimental to the fishery if it gets too wide spread. The next few months are going to be very interesting and we all need to keep a close eye on our fishery. Do not, I repeat Do Not, write off the Lake completely just because they opened the spill way. Every year they do this we do find the red fishing excellent and we seem to always bump into a pocket of clean water with huge schools of trout trapped inside, where that may be we will just have to see. Make sure to watch all of our previous DockSideTV episodes on fishing during a spillway or right after a spillway opening and you will see we have made some amazing catches in the midst of all the fresh water. The pic above or below was just recently with Capt Kris Robert where we crushed the trout up to 4 pounds on the trestle in very dirty river water. A lot of times before the river water sets in too much it is simply just dirty on the top.